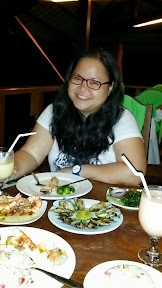 This is me, enjoying my first meal in Leyte. I'm hoping to make quick daily updates on this trip from my phone. I'll add the pictures when I'm back home, and maybe edit and rewrite some of the post, me being me. In the meantime, check out my Instagram feed. Day 1 officially started at 7.30pm with a slightly rough landing at Daniel Z. Romualdez airport. We had a good laugh, because a few minutes earlier, the Air Asia Zest pilot had announced we were about to land at Tagbilaran, earning him a few snickers from the passengers. For a minute I thought the pilot had really gotten the route wrong, since he said Tagbilaran several times, even saying we could expect good weather! The thing is, after the earthquake last Tuesday and the hundreds of strong aftershocks, I don't think I'm ready to return to Bohol just yet! Anyway, at the airport, Marchie and I stopped at the Tourism Center desk to ask about vans leaving for Catarman, Samar that evening. The last trip was at 7pm, we found out, so we had no choice but to stay in Tacloban for the night. Not bad, really, because that way, if I am awake for the trip to Catarman, I can enjoy the view from the van. I'm so excited to cross the San Juanico Bridge! It's the stuff of grade school textbooks! We asked for directions to a good hotel, and the people were very helpful. Armed with commuting tips from locals, Marchie and I walked outside the airport and took a jeep with an Imelda sign board (P13 per head) and got off at GV Hotel. A standard room for two is at a promo price of P650. We had to pay upon check-in, which was fine by me because we were leaving very early in the morning the next day anyway. GV Hotel is a budget hotel, but I was happy to discover that the hotel is clean, secure, and energy-efficient. The room has a bathroom (three times bigger than the bathroom we had at the Chunking Mansion in Hong Kong), and it's also clean, with the plumbing intact. Not bad for P325 per head. After freshening up a little, we stepped out for dinner. We were just an hour behind the itinerary I made, so I was feeling pretty good. We took a "multicab" (a tricycle, really) to Leyte Park Resort to get to Pier Tres, which I'd read about while doing research for our Leyte-Samar itinerary. The multicab driver was an old man, very friendly. He chatted with us, first asking if we were really Tagalog, then telling us about the languages in Leyte. I had expected people to speak Visayan, which I still understand, but they spoke Waray! The trike ride was P30, but we gave him P50. Dinner at Pier Tres was great for P705. We had fried shrimp, baked mussels, and fruit shake (watermelon-mango for Marchie and mango for me). Pier Tres is an above-water seafood restaurant that's all lit up with pretty lights at night. Across it is Bar-ko, also lit up in pretty colors and featuring, at least that evening, a live band. So we enjoyed a quiet dinner at Pier Tres and the live music from Bar-ko. Did I mention the moon was full? After dinner, Marchie and I walked out of Leyte Park, passing by the nice little nice bars near the gate. It was a Sunday night, so there weren't a lot of people, but the area was still lively. I found the bars really quaint -- each one had its own style and, I'm guessing, draw. I haven't seen Leyte in daylight yet, but I already love it! Biri Island is on the itinerary tomorrow. It's a six-hour trip from Tacloban to Catarman. That's why we want to leave at 5am. Good luck to us!